Engine Workshops - PLANE-CRAFTERS Inc.
One of our goals is to provide opportunities for owners and flyers of home-built and ultralight aircraft to learn more about their engines. We do this by offering engine seminars, engine installation workshops and engine "Colleges" at our facilities. Over the years, such events for the Rotax 912, the Jabiru 3300 and the Corvair engines have all been very informative and successful at different Zenair Build-Centers. If interested, please contact us and have your name (and engine-of-interest) added to our lists; Events will be scheduled for a specific engine installation once enough people have expressed an interest. These Seminars are for individuals and groups from all backgrounds and from anywhere, interested in improving their knowledge and skills associated with the installation, operation, fine-tuning and maintenance of light aircraft engines and their related systems. 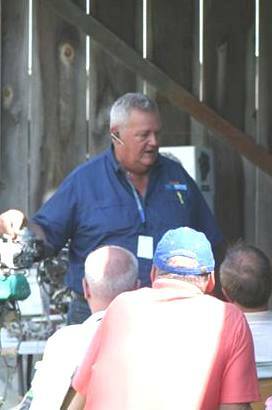 All our engine seminars and workshops are led by experienced professionals. Select the seminar of your choice and contact us to register. Rotax 912 seminars are now offered at three levels. Each seminar is a prerequisite for the one that follows. Please note that we require a minimum number of participants for scheduled seminars to run; we also have limited group sizes. Call for details. The focus of Level II is Regular Maintenance. Participants will be shown all aspects of the 100 hour inspection and over two days, will learn the correct procedures for oil changes, spark plug changes, gearbox inspection, carburetor inspections and balancing, compression testing, and other critical inspection items. In addition, system operations and common trouble shooting for the following systems will be thoroughly covered: dual ignition, fuel & carburetion, gear box, oil & dry sump, ignition modules and coils. If interested, call and have your name added to the list; Seminars will be scheduled when minimum group size has been achieved. As the name implies, these 3-day programs are designed to teach you everything you need to know to complete the engine installation on your kit aircraft. We start with a fuselage, an engine and a FWF package, and we install everything: engine, radiator (if applicable), oil cooler, exhaust system, baffles and even the prop! Fuel lines are hooked-up, so are throttle cables, choke, mixture control & primer (as applicable) and battery... If time permits, we even start on the engine cowling! Our objective is to reach first engine start! For such a program to be scheduled, we need an airframe builder with an engine & FWF Package to bring all three to our hangar. We'll ensure that the expertise and guidance is on-hand to complete the task during the allotted time. Up to six participants (plus the owner) can enroll to learn how to install the engine. Based on demand, engine programs can be planned for the Rotax, the Jabiru, the UL-Power, Continental, Lycoming, Corvair or Viking engines! Engine Colleges are different again in nature from the above installation workshops and Seminars. Colleges are structured to allow individual engine owners to learn how to rebuild their own aircraft engine. Ideally, each participant will bring his own used, second-hand, "old" engine and will learn how to make it airworthy again (for later installation in their self-built aircraft). These Colleges are modeled after the very successful events of that name started by William Wynne for Corvair engine enthusiasts. Plane-Crafters aims to host similar events for participants who wish to rebuild their Continental O-200 and Lycoming O-360 engines. Again, organizing such events will take time, so please contact us early to place your name on the appropriate list. Every effort will be made to accommodate the majority of applicants. Note: These Colleges are not restricted to owners of Zenair kitplane designs - They are open to all interested builders! These workshops, seminars and colleges are held at the Plane-Crafters facility (unless otherwise indicated) from 9am to 4pm on each of the scheduled days. While there will be classroom components, the seminars will also involve workshop time as well as opportunities to inspect installed engines on aircraft. We recommend you wear comfortable shoes and dress for the occasion and the season (leave your Sunday best at home). You’ll want to take notes, so bring a note pad and pens. Some engine-related documentation and manuals will be available on hand, but feel free to bring your own. Where to stay: Discounted room rates have been negotiated at the Best Western Highland Inn; Call 705-526-9307, be sure to mention Plane-Crafters or Huronia Airport and ask for the airport discount when making a reservation. If you have any questions, or would like more detailed information, ask for Michael at 705-526-2871 or e-mail us at planecrafters@gmail.com. Click here to register your interest in any engine programs!